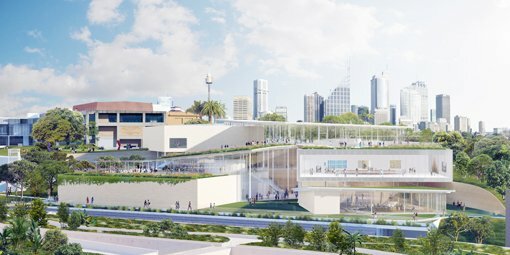 The Art Gallery of New South Wales has welcomed planning consent for its expansion, the Sydney Modern Project, paving the way for construction of its new building to commence in early 2019. The NSW Minister for the Arts the Hon. Don Harwin today announced the Gallery’s State Significant Development Application (SSDA) had been approved. The new building, designed by Pritzker Prize-winning architects, SANAA, will close to double current exhibition space. This will enable the Gallery to show more of its outstanding art collection and host more of the best exhibitions from around the world, increasing visitation to an expected two million people a year. Art Gallery of NSW director Dr Michael Brand said the project’s planning approval was a green light for art, artists and audiences. “The Art Gallery of NSW is delighted that its expansion plans have been approved to create an art museum experience that brings together art, architecture and landscape in one of the most beautiful cultural precincts in the world. Our transformed institution will represent Sydney’s bold spirit as a leading 21st-century art museum with a deep commitment to both Australian and international art,” Dr Brand said. Art Gallery of NSW president of the Board of Trustees, David Gonski AC, said the widespread support for the Gallery’s compelling vision symbolises the importance of the arts to the community. “This new public asset will deliver enormous cultural and economic benefits to Sydney, NSW and Australia for generations to come,” Mr Gonski said. “I applaud the NSW Government for funding the expansion of the state’s leading art museum, and our generous donors for their extraordinary endorsement of the Gallery’s transformation. “I would also like to pay tribute to the Gallery’s past and present trustees, our director Michael Brand and his predecessor Edmund Capon, and all the staff over many years who have worked so hard to bring the much-needed expansion to life,” Mr Gonski said. Chair of the Royal Botanic Gardens and Domain Trust, Philip Marcus Clark AM, said support to the Art Gallery of NSW would continue to be provided for the Sydney Modern Project through the construction process and beyond to create the best long-term outcomes for the precinct. “By continuing to work closely with our neighbours, we look forward to using this unique opportunity to improve public access to the cultural, recreational, horticultural, scientific and educational benefits our precinct provides to millions of visitors each year,” Mr Clark said. The $344 million Sydney Modern Project is the largest public-private partnerships of its kind in the Australian arts. The NSW Government has funded $244 million, and the Gallery has attracted unprecedented philanthropic support. The Capital Campaign, under the chairmanship of Gallery trustee Mark Nelson, is on the cusp of reaching its $100 million target. The expanded Gallery will include a prominent destination for Aboriginal and Torres Strait Islander art; a large gallery for major exhibitions; a spectacular contemporary art space repurposed from a decommissioned WWII oil tank; and spaces for family, learning and educational programming to double student and teacher visits to 200,000 annually. A public Art Garden will link the new and existing buildings, for all visitors to the Gallery, the Domain and adjacent Royal Botanic Garden to enjoy. The Gallery is the first public art museum in the nation to achieve the highest environmental standard for design with a Green Building Council of Australia 6-star Green Star design rating, exceeding its original 5-star goal. “Achieving a 6-star Green Star design rating is testament to the high-quality design of the Gallery’s expansion and our commitment to sustainability. We are helping set a new international standard for art museums,” Dr Brand said. Since 2015, the Gallery has worked with SANAA to evolve the design to maximise open space across the site, integrating the building with the landscape and enhancing sustainability initiatives, including rainwater harvesting, extensive solar panels and a seawater heat exchange system for air-conditioning. SANAA has designed some of the world’s most prestigious museums, including the Louvre’s satellite museum in Lens, France and the New Museum of Contemporary Art in New York. “I look forward to continuing to work with Kazuyo Sejima and Ryue Nishizawa and their team as well as Sydney-based Architectus on the next phases of the project in the lead up to the opening,” Dr Brand said. The Gallery’s State Significant Development Application was submitted in November 2017 after more than three years of community consultation underpinned by a Master Plan and an international design competition with a world-renowned jury, who continue to be involved in the project. The building’s final design has been unveiled as part of the SSDA approval. Construction is expected to commence in early 2019 for completion in 2021. The Gallery, which provides free admission, will remain open during this time.